Oven mitts have a way of accumulating a bit of every meal they help prepare. Put to use grabbing hot pots and pans, they pick up stains and sauce splashes as they go about their duty, eventually looking like something out of a horror movie. Not so with the Mastrad OrkaPlus A82301 Silicone Oven Mitt with Cotton Lining . Silicone on the outside, cotton on the inside, the oven mitt is easily cleaned. The exterior wipes down and is non-staining, while the interior cotton lining is removable and machine washable. Waterproof and heat resistant up to 480-degrees Fahrenheit, the oven mitt is made for long lasting use no matter how messy you get while cooking. Orka has taken their famous silicone oven mitt and improved on it. 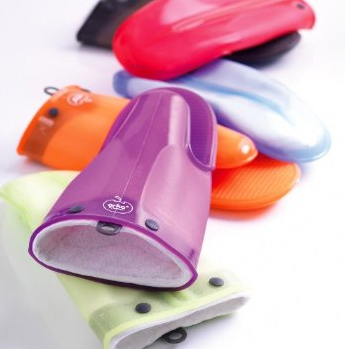 It has all the same features you’ve come to love in your Orka Silicone Oven Mitt and improved upon them. 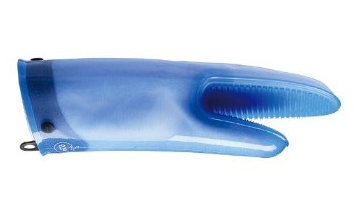 As with the original Orka Oven Mitt, the OrkaPlus Oven mitt is water proof, even in boiling water. The new mitt is more flexible, making it easier to grip hot pot handles, or dishes out of the oven. Orka has lined their new mitts with a removable, super-soft cotton lining for comfort. They have triple the heat resistance as the original oven mitt, and they are non-staining and easy to clean. The removable cotton lining is machine washable for added convenience. Heat safe to 480 degrees Fahrenheit, use your mitts to remove pans from the oven, or a potato from boiling water. Your OrkaPlus Silicone Oven Mitts will be the last oven mitts you’ll ever need.